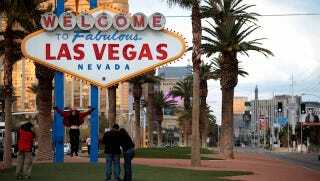 Much like the I Heart NY logo or the Hollywood Sign, the sign welcoming visitors to Las Vegas was not meant as a grand gesture when it was conceived. What was a simple act of civic self promotion—an ad, really—became a piece of public art and eventually an icon in the public domain, plastered on fuzzy dice and shot glasses that line the Strip’s souvenir shops. But who made it? The sign’s heart and soul—and in many ways, the city’s—is attributed to Betty Willis, who died Monday at 91. When she was hired to design the piece, the Las Vegas native was working as a graphic designer, creating newspaper ads for shows, and, as the building boom in the city peaked, neon motel signs. In 1959, a salesman at a neon company proposed a sign that would entice visitors driving in from LA. Willis was tapped to design a flashy way to welcome tourists to their destination—which was really only a handful of hotels on a dusty highway. The sign is actually not in the city of Las Vegas at all, but rather in an area of still-unincorporated Clark County that encompasses much of the Strip—so it’s leased to the state of Nevada by Young Electric Sign Company (hence the “YESCO” logo at the bottom). Willis’s design was inspired by two logos which were reaching a cultural nadir in the late 1950s: Goodyear and Disneyland. The star atop an oblong rounded rectangle is typical of the Googie architectural style found in most of the city’s motels at the time. When it came to the wording, however, the “fabulous” was added by Willis, using lettering that evoked local hand-painted signage. The sign became an instant hit. Visitors would stop on their way into town to pose with it. Unlike most of the other neon signs in the city, this one is incredibly accessible, straddling a median at the far south end of the Strip (which was miles away from anything built when it was first erected). You can stand just beneath it and marvel at the size of the lightbulbs, the clear laces of neon tubing. The area around it has become almost an unofficial pocket park and there’s a parking lot there now that accommodates dozens of tour buses. And of course, you can easily Instagram yourself in front of it, selfie stick or not, cementing its relevance in today’s culture. It even has its own Twitter account. What was once a gaudy ploy to make drivers stop and give Vegas a spin has now been dwarfed by the glittering towers in the background. Visitors coming from LA most likely sail into town on the 15 freeway now and most miss the sign completely (some might even be duped by a replica that’s situated in downtown Vegas). But on all my trips I make a point to roll into town this way so I can see the sign. Even when I leave I go back the way I came. The opposite side of the sign, so rarely photographed, is like a special, secret message beckoning visitors to return. Guess what? They always do.